Get ready to learn about a dating app focused on bringing love to dog lovers. Visit us at Red Hook Brewery in Woodinville, WA. Check out the Facebook event for more information! 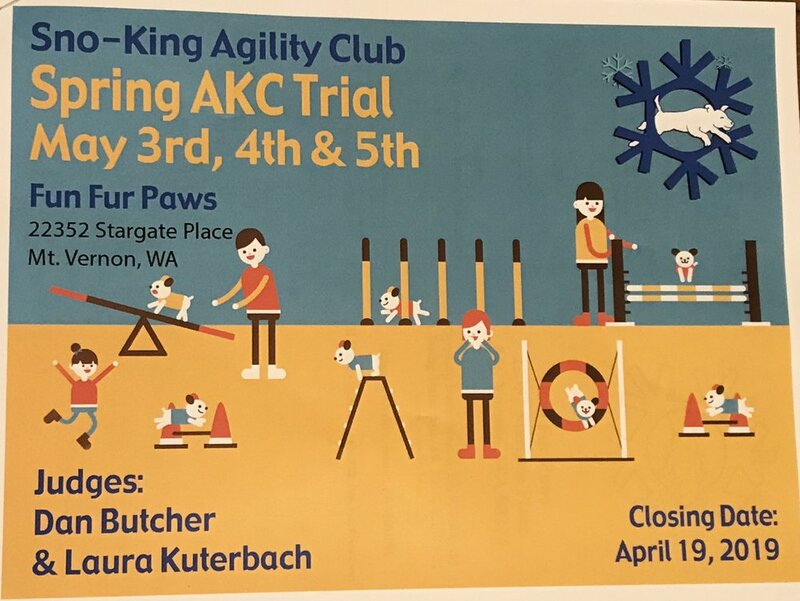 Did you know that the Sno-King Agility Club will be hosting the AKC Agility Trials at Fun Fur Paws on May 3-5? You can enter online at WWW.R2AGILITYONLINE.COM to register for the Trials. We hope to see you there. Break a leg! Opening day for the Wallingford Farmer’s Market is May 15th! We hope everyone will come out to kick off the season! Check out more information at the Wallingford Farmer’s Market website. This event in Kirkland at Juanita’s Beach Park will raise money for the American Cancer Society. Visit the Facebook Event page for more of the event details. Everyone loves the Wallingford Farmer’s Market! 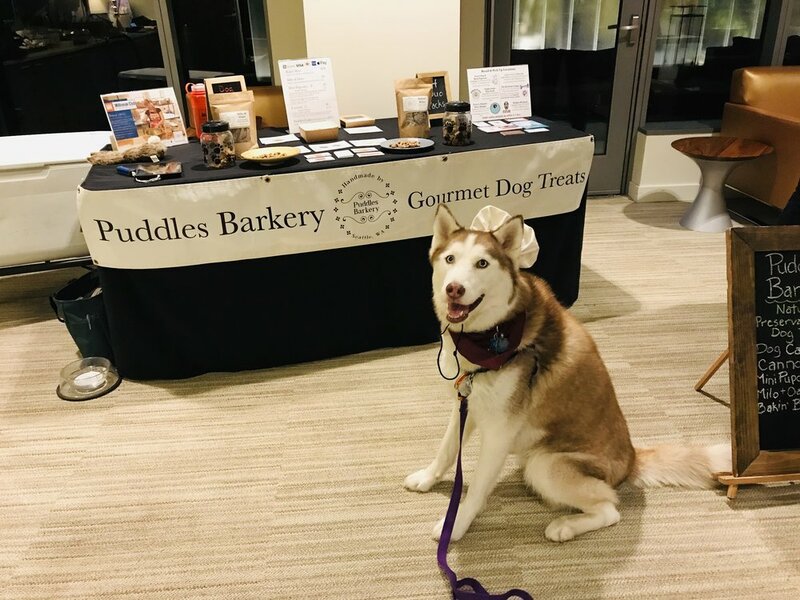 We hope to see you each Wednesday to stock up on your Puddles Barkery treats! Stay tuned for all the fun planned for DogFest 2019! 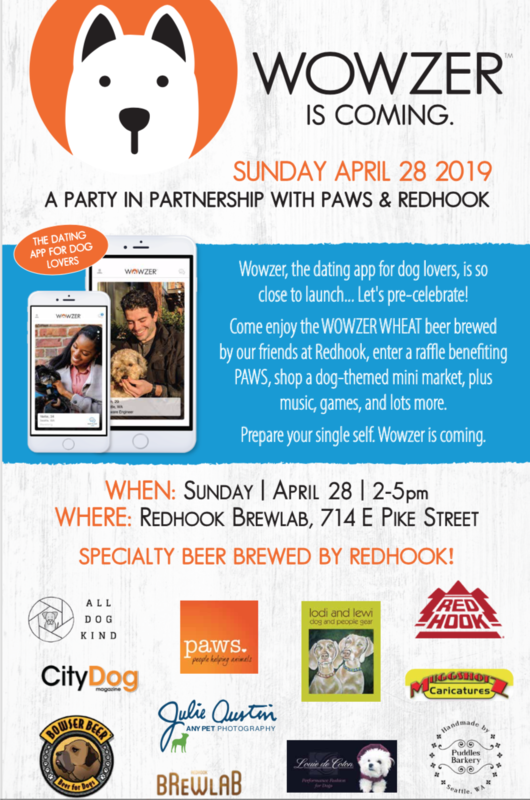 Come on out for a quality beer and to help support Pawsitive Alliance. They do great work with the #WhyNotMePets program that focuses on getting animals who have been in the shelter for over 90 days find their furever home. They also sponsor spay and neuter pop up clinics to help keep the shelter-pet population down. We will not be at the Market for the next two weeks (July 17 and 24) due to family travel. We look forward to seeing you again on the 31st! We are back this week! It’s a party with Xfinity, Frolic Pet Services, All Dog Kind, Dirtie Dog Photography, Louie de Coton and us! We love our pets! 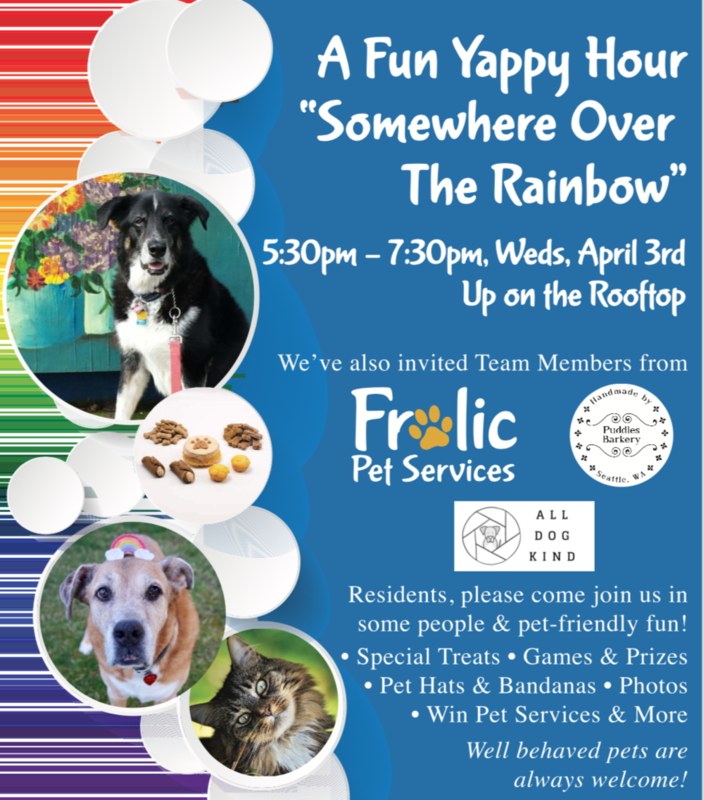 To celebrate one of the best days of the year, we are partnering with Premiere on Pine, Frolic Pet Services, and All Dog Kind to put on a fun event. Happy National Pet Day! April 3rd is Find a Rainbow Day! Come visit this pet-friendly event and meet us plus our wonderful friends from Frolic Pet Services and All Dog Kind. Meet the Baker & Mini Pupcake Flavor Release! Does your pup love to play at Pickles Playland?!? You are in luck. Kari, the baker and owner of Puddles Barkery, will be hosting a table to introduce our new Mini Pupcake flavor: Blueberry Cheddar! Don’t forget to grab a sample when you pick up your pup from a fun day of play. We look forward to meeting all the regulars and sharing our natural, preservative-free treats. See you there! Save the Facebook event to your calendar so you don’t miss it! Join us at the Belltown Pub with your pup to support the Emerald City Pet Rescue! There will be giveaways, raffle prizes, an eating contest and a lot of fun while we raise money for the Rescue. Get your tickets on the Facebook event today! Best of luck to all those talents PNW Portuguese Water Dog Club dogs competing at the AKC Meet from March 15th-17th! We will be joining Spratt Pet Portraits at their table on Sunday, March 17th, to watch these fantastic pups compete. Please stop by the booth to meet Suzanne, pick up some treats for your deserving pups and check out Suzanne’s paintings. They will also have a silent auction to help raise money for their Club, including a gift basket of Puddles Barkery treats! Come and join us in celebrating Voff Bark & Brew’s first year in business in Greenwood, Seattle. Have a cold one while your pup plays in the dog park, pick up some treats from us, or a fun hat for your pup from All Dog Kind. We are throwing a pet-friendly party for all the residents of Belcarra in Bellevue. Together with Frolic Pet Services, All Dog Kind, Dirtie Dog Photography and Louie de Coton, we will have games, treats, a photo booth, tiny dog hats and so much more fun! We hope you and your pets will join us for the party! Are you ready for a fun Wine and Chocolate pairing? We will be there so you can get some treats for your furry tasters too! To get your tickets or for more information, check out the Facebook event. Join us for a wonderful pet-friendly party. Dirtie Dog Photography will have a two-hour photo booth. All Dog Kind will have fun hats and bandanas to play dress up. Frolic Pet Services will be there to tell you about all the fun things they can do for your pet when you’re away. And don’t forget the treats! We will be offering a Heart Duo special for $3. Do you bring your dog to work? Don’t forget to bring your pup on Monday so they can try our preservative-free treats for themselves! We will be visiting the WeWork in Lincoln Square Bellevue. Stop by for a sample and pick up your pup’s favorite goodies. Together with Frolic Pet Services, we will be throwing a pet party for the residents of The Olivian to celebrate National Love Your Pet Day! We can’t wait to meet everyone. We hope you will come out, bring your pets, play some games, enjoy the photo booth, and pick up some treats! More information to come as the event gets closer. Get ready for a pet-centric celebration for all Premiere on Pine residents for Change a Pet’s Life Day! We hope you will all stop by the 6th floor in the management office area for some fun with Frolic Pet Services, All Dog Kind and us. We are honored to be a pat of the Ballard Art Walk with our good friends from Dirtie Dog Photography, Frolic Pet Services and All Dog Kind. For more information on all the exhibits for the event, please visit the Facebook Page. We can’t wait to meet every-pup at this Fun Match to get ready for the 2019 Trials. These talented pups will treat this as a practice-run for the upcoming trials in obedience, rally and agility. If you and your pup would like the opportunity to attend this practice trial, please email us and we will send you the form. All entry fees will be used as a fundraising opportunity for the Cascade Pembroke Welsh Corgi Club. Santa Paws is Coming to Monroe! 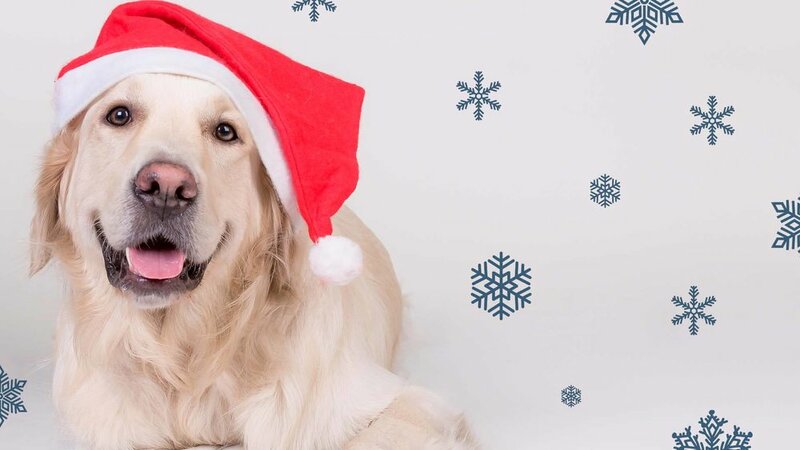 Bring your fur-baby in for a day of fun, games, and pictures with Santa Paws! Saturday, December 15th at Rairdon's Chrysler Dodge Jeep in Monroe. See you there! Check out more information on the Facebook event. Celebrate the holidays with your neighbors at VODA Apartments. The staff at VODA and Xfinity will have adult beverages and we will have our treats to help you finish your holiday shopping. Celebrate the holidays with all your favorite Pioneer Square and Seattle dog businesses. The Downtown Seattle Association is putting on another fun Howlidays event including a pop-up dog park and costume contest! See you there. Find out more details about the event for the Facebook event. Are you ready for the December Dog Corner at The Commons at Ballard on December 8th?! We can't wait to meet you and your pups - plus we have natural dog treats to try, pet photography to gaze upon, dog hats to try on and lots of pets for each pup! Come out and meet our group including Dirtie Dog Photography, Frolic Pet Services and All Dog Kind. The Ballard ArtWalk is a monthly neighborhood event that celebrates the Arts and Creative spirit in Ballard, while promoting our vibrant community's businesses. Stroll through the heart of Ballard and explore our vibrant art scene every second Saturday of the month! For more information on vendors and the ArtWalk, please check out the Facebook event or Visit Ballard’s website. Coffee and Dogs! Bring your pup to Down Pour Coffee Bar in Redmond to meet Puddles Barkery. We will have samples and all the treats for your holiday gifting needs. We hope you will stop by for a coffee and meet us! Come out to meet Kari and Kora, the inspiration of Puddles Barkery at our new retailer, Down Pour Coffee Bar. Stop in for a coffee and a treat for your pup. Show your support for Motley Zoo Animal Rescue and shop the Holiday Bazaar for all your gifts this year. We will also have gift cards for your family and friends. If you’re lucky, you may find a new family member just before the holidays. Prepare to meet the Motley Zoo’s current rescues to see if they are the right match for your family. The Ballard ArtWalk is a monthly neighborhood event that celebrates the Arts and Creative spirit in Ballard, while promoting our vibrant community's businesses. Stroll through the heart of Ballard and explore our vibrant art scene every second Saturday of the month! This month, stop by the Puddles Barkery booth for handmade dog treats for the special pup in your life! You will also have the opportunity to meet Marika with Dirtie Dog Photography, Lauren with All Dog Kind and Whitney with Frolic Pet Services. We can’t wait to meet all the neighborhood pets. For more information on vendors and the ArtWalk, please check out Visit Ballard’s website. Get into the Howl-iday spirit and join The NOAH Center for their annual Santa Photos and Gift Fair. Photos are $10 a pose with pets and kids, they will be emailed to you within 2-3 weeks for you to use on your holiday cards. We will be there along with over 15 other craft vendors there with unique and beautiful items that you can buy as gifts for the upcoming holidays. We hope each resident and their furry companions will join us for some pet-friendly fun! We are partnering with Frolic Pet Services and Xfinity for a memorable Halloween-themed party. There will be treats, games and prizes, a Halloween photo booth, and costume contest! The costume contest winner will receive a Puddles Cake! Join us this Sunday, October 28th from 3-7 pm for our Howl-o-ween Pup Crawl in the Greenwood area to celebrate this holiday season while benefiting Seattle Humane! 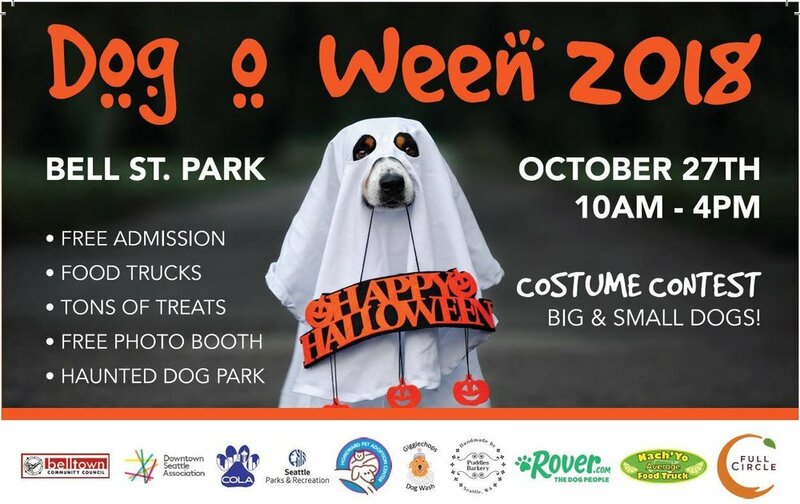 There will be freebies valued at over $200 for all attendees, festive games such as bobbing for bats and trick or treating, a photo booth, and a social fun time as you stop by five different stops on this pup crawl! All humans and pups are encouraged to dress up in a Halloween costume and will receive an extra raffle ticket for doing so. Get your tickets and find out more information on the Facebook event! Are you ready for some awesome music and a party on Bell Street? We can’t wait to see you there. There will be tons or treats, a large and small dog costume contest, a photo booth, a haunted dog park, and live music. Join us and the Downtown Dog Lounge for the 3rd Annual BARKTOBERFEST at the Amazon Headquarters in South Lake Union! This year’s festivities include the Spooktacular costume contest, demonstrations from King County Search Dogs and the Downtown Dog Lounge training team, adoptable dogs from Dog Gone Seattle, music, games, a haunted garden and so much more. In addition, select Barktoberfest activities will also help raise funds for our charitable partners Dog Gone Seattle and King County Search Dogs. Get your costume contest tickets (free) to reserve your spot and learn more on the Facebook event. We are partnering with Frolic Pet Services to throw a fun Halloween Party for all the residents at Premiere on Pine and their pets. We will have treats, a Halloween photo booth, animal masks for the humans and some fun props for our furry friends. We hope you can join us, since it will be a Boo-tiful time!